Dogs and People Living Together. Dig it…here’s the scoop from THE NEW BARKER on dogs, Yappy Hour at Cappuccino’s Cafe in Dunedin, Scottish Terriers, Manatee County Animal Services and PugZ Bar & Grill. What do you get when you put a group of Scottish Terriers together with their humans? A whole lot of Plaiditude. On January 9th THE NEW BARKER and Cappuccino’s Altro Posto Cafe in Dunedin hosted the Scottish Terrier Club of Tampa Bay during the monthly Happy Yappy Hour. And, there was plenty of Tartan swirling around as this fun and feisty breed socialized with one another. Alas, while it was too cold for any of the men to brave wearing kilts, there were more than a few Scotties who donned some handsome plaid dog wear. 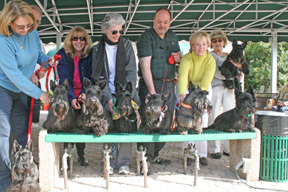 The gathering was an eclectic group that included several champion Scottish Terriers, experienced agility competitors and a rescued puppy mill breeder dog. The event raised around $500 for the Club’s own rescue group. “It was so much fun that we’ve already booked the event for next January,” said volunteer and Rescue Coordinator, Janet Skinner. Rescue groups interested in having a Happy Yappy Hour booked can call Cappuccino’s Cafe at 727.738.8009. There are some Sunday openings still available, but they do go pretty fast. What do you get when government officials and their constituents communicate by putting creative ideas on the table? 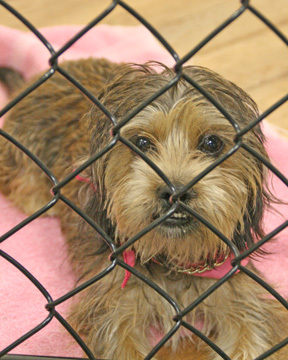 A solution that will help save more dogs and cats from euthanasia. That’s exactly what happened less than a year ago, when Animal Services of Manatee County floated a concept to the county commissioners that would make adoptable dogs and cats more accessible to the public. The idea came to fruition and just this week, on January 10th, Manatee County Animal Services opened its new Adoption Center at 305 25th Street West, Downtown Bradenton. The vacant space in a county-owned building is a visible, bright and airy storefront that should get plenty of foot traffic. “We’re convenient to folks who work Downtown and might want to stop in during their lunch breaks,” said Animal Services Chief, Kris Weiskopf. 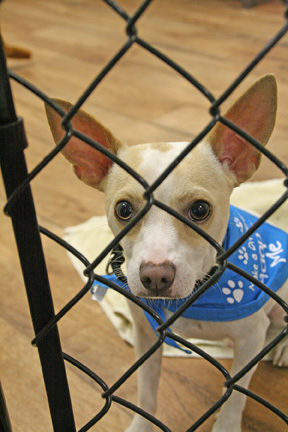 KuDOGs to Manatee County Animal Services for such an innovative initiative. It’s this type of progressive thinking (which by the way did not necessitate additional funding) that makes a difference in the positive growth of a community. Shown above are two dogs that were available at the Adoption Center’s opening on Monday: Mazda and Jésus. Dunedin has yet another dog-friendly eating and drinking establishment. PUGz Bar & Grill has embraced the dog community and the dog community has certainly embraced them. 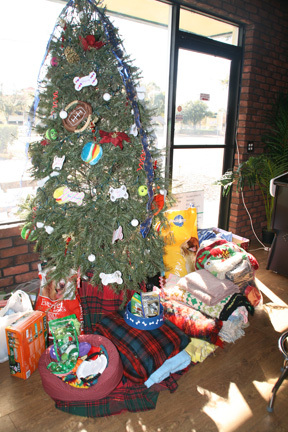 During the holidays the restaurant collected donations for Dunedin Dog Rescue under their Christmas tree. Stay Pup-to-Date on dog-friendly events by visiting THE NEW BARKER calendar and also by signing up for Weekend PupDates. You’ll receive a current list of dog-friendly events a couple of times a month. Some hot dog-friendly events this weekend: Florida Classic Clusters/Brooksville; Cocktails for a Cause/Mise en Place/Tampa; Dogs Dig Downtown Bradenton; Barkarilla at Gaspar’s Grotto/Ybor City; Mutts & Martinis/Tavares. Need more? Be sure to subscribe to the one Florida lifestyle magazine devoted to dogs and their dog-loving human companions. THE NEW BARKER is a quarterly magazine full of relevant stories, beautiful photos, travel and health tips and more. Each cover of THE NEW BARKER features an original piece of art by a different Florida artist, making each issue a collector’s item. 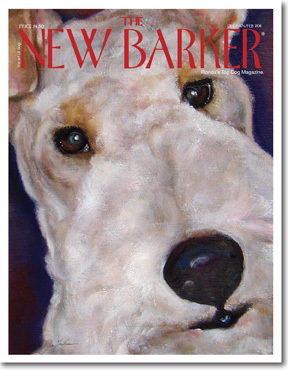 Do you have the latest issue of THE NEW BARKER yet? Previous Previous post: Happy HoliDogs and to All a Good Dog. Next Next post: Field of Dreams and Other Dog-Worldly Events.